Are you afraid to show your teeth when you smile? Do you cover your mouth with your hand every time you laugh so that others won’t see your teeth? We live in an age dominated by social media, celebrities and we all feel the pressure to perfect. Fortunately, there are a lot of treatments available these days that can help you achieve the appearance you’ve always dreamed of. From non-surgical fat reduction treatments such as Coolsculpting to innovative cosmetic dentistry procedures. Having gorgeous pearly-whites is a huge social confidence booster – so although those who have perfect teeth may question the idea of going to the dentist just to make teeth look better, those who suffer from aesthetic dental issues will understand why cosmetic dentistry is so important. Most dentists offer the traditional polishing, caps, crowns, veneers and Invisalign braces. But new advances have been made, and some specialist dentists are offering cutting-edge cosmetic dental treatments. There’s even a computerised system that analyses your smile to see how the proportions of your teeth fit in with your lips and gums! 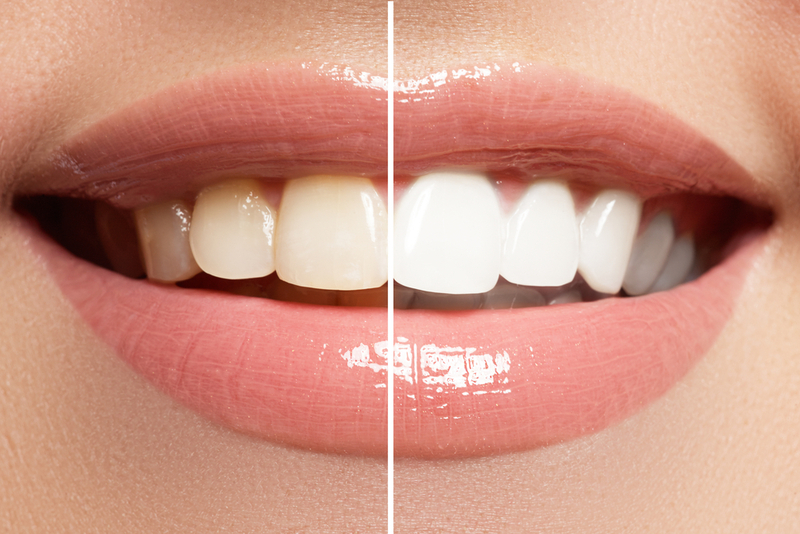 When whitening your teeth, the most important thing to check is whether the treatment can weaken teeth. Watch out for home remedies such as baking soda and be cautious about off-the-shelf tooth whiteners. The latest tooth whitening techniques used by dentists don’t weaken your teeth and give you instant results. Here’s how this high-tech cosmetic dentistry solution works. A laser beam is used to activate a carbamide peroxide or hydrogen peroxide paste that the dentist applies to your teeth. The chemical reaction that this process initiates lifts stains from your teeth so that when your dentist washes away the paste, your teeth are left looking white and sparkly – just like you want them to be! The treatment takes about an hour and a half, and you will have to repeat it every three to six months if you want to keep your teeth white. Don’t worry! No-one’s going to kick your teeth. This process is done using a special mouthguard that has to be made to order so that it provides a precise fit. The rest of the treatment is very similar to pure laser treatment. The mouthguard holds the whitening gel in place and the laser is used to activate the reaction that whitens your teeth. This method will require two appointments before you get your dazzling smile, but it’s also a little bit cheaper than the pure laser treatment. If you like the end result, you’ll need to have it done again after three to six months. Back in the day, you could already get veneers pasted onto your teeth to hide discoloration, but advances in dental adhesives technology make veneers last a whole lot longer these days. Choose porcelain veneers if you teeth are very badly stained, uneven or broken. Very little drilling is required, and that’s mainly directed at shaping your veneers. You’ll need to visit your dentist twice, but barring accidents, the veneers will last fifteen to twenty years. Wearing braces isn’t anybody’s idea of a good time, but new advances have made it possible to get your teeth straightened without the need for wiring up. Once you’re in the dentist’s chair, you’re given a local anaesthetic. Now the dentist uses an electrosurge unit to remove tiny pieces of gum, reshaping your gums to match a new set of veneers that will be bonded to your teeth. To get this procedure done, you’ll have to visit your dentist three times, but you’ll also have straight teeth a lot quicker than if you had to have them pulled into place with wires. It’s great being able to smile with confidence, and the newest procedures in cosmetic dentistry are making it easy for you to have teeth fit for a superstar!